Keeping our members upskilled and building new capacities in health care is vital to closing the gap in health inequalities in Australia. 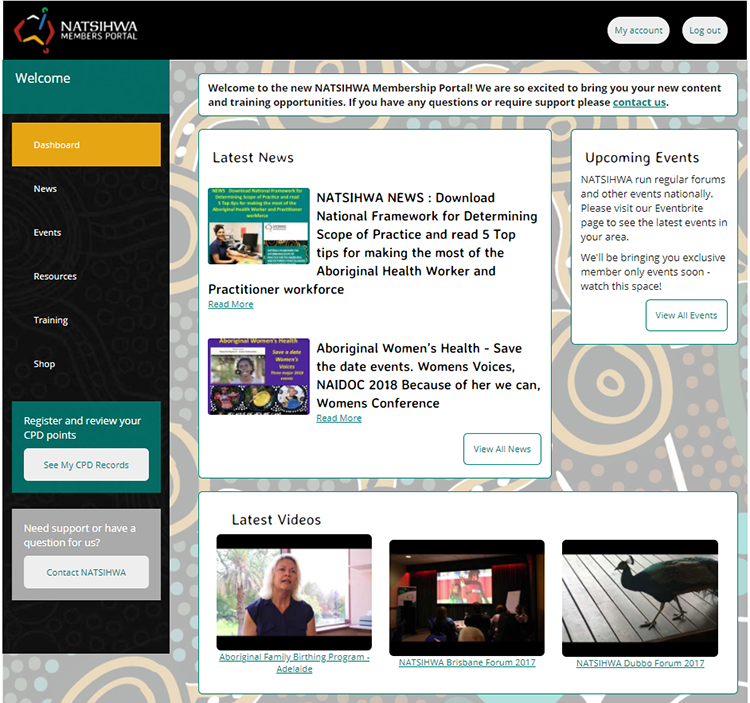 Through our Members Portal, NATSIHWA provides a resource to help Aboriginal and Torres Strait Islander Health Workers and Health Practitioners to access training providers, keep track of their Continuous Professional Development (CPD), and keep detailed records of their training and learning activities in order to meet AHPRA requirements. The Members Portal also includes a range of resources to assist Aboriginal and Torres Strait Islander Health Workers and Health Practitioners to deliver effective health care in their communities. It also is routinely updated with news and information relevant to Aboriginal and Torres Strait Islander health and wellbeing. Members can find out all the latest news and professional information easily through this portal, and new resource links are added regularly for members to keep up-to-date with training options and improve their professional knowledge and skills. Our Members Portal is only available to Full Member of NATSIHWA.To become a NATSIHWA Full Member, you need to be an Aboriginal and/or Torres Strait Islander person who has completed a Certificate II or above in Aboriginal and Torres Strait Islander Primary Health Care. Once membership is processed, you will be able to register to access the Member's Portal.